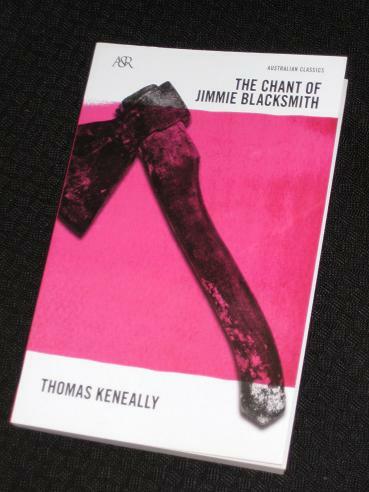 The Chant of Jimmie Blacksmith is one of Thomas (or Tom) Keneally’s best-known works here in Australia, and it’s fairly easy to see why. It’s the story of a half-caste Aborigine who wants to get on in the world, having lost faith, and patience, with the lifestyle of his family and tribe. With some gentle encouragement from the Methodist minister on the settlement he is attached to, Jimmie decides that he needs to make an effort to succeed in life, an effort which involves leaving the traditional past behind and embracing a white future. While Keneally himself claims in a foreword that this is not one of his better books, it’s one that has captured the imagination of readers since its publication in 1972. The key to the story is that Jimmie, unlike his brother Mort (another of the main characters), is the product of a relationship between a white man and a native woman. He is different both in appearance and mindset to his kin, but unable to completely escape his tribal upbringing and his responsibilities to his extended family. Caught between two worlds, he is destined to fall into a deep void. Of course, he is pushed towards his fate by the white men who employ him (while always looking to exploit and cheat him). Each time Jimmie works hard, his employers’ cruelty or meanness forces him to move on, an action which reinforces the stereotype of the lazy ‘blackfella’ who ups and leaves when he pleases. Even his time as a police tracker is cut short by a savage, cruel event.